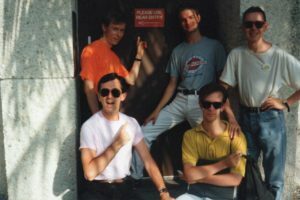 In October 1990 the Pink Singers became the first European LGBT+ choir to sing in the USA when 18 of us visited Florida. 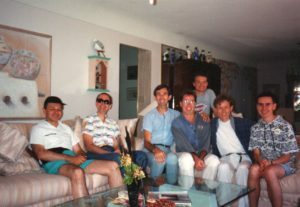 We had been invited by the 70 strong Gay Men’s Chorus of South Florida to perform with them at a concert called “International Harmonies” in West Palm Beach. To celebrate our visit the Mayor of West Palm Beach named Friday October 26th 1990 “Pink Singers Day”. The venue for the concert was a huge converted cinema and we were so good even the back row stopped what they were doing! Our repertoire included “London Is London”, “Always On My Mind” and a medley of songs by George Gershwin. We also introduced the audience to Tom Robinson’s “Glad To Be Gay” with new lyrics for the occasion. As well as doing the concert, we also did a special fundraiser in aid of the Health Crisis Network in Miami, who continue to support people with HIV and AIDs. At that time, the pandemic had impacted heavily on the local Hispanic community and their children, so we had a very mixed audience who cheered us on our way. The highlight of the event came as we sang the song “Somewhere Out There”, when a typically noisy Miami thunderstorm erupted outside. The song never sounded more impressive. With the performances over, the Pinkies were also able to enjoy the many delights of South Florida (some pictured here, some not!). A few holiday romances took place and some lasting friendships were made. We were to meet up with the Florida chorus again two years later at the Festival of Gay and Lesbian Choruses in Denver.